A great night of retro music and entertainment was enjoyed by over 100 guests at the SCALP Retro Night. Colin Murray, aka 'The Funk Master' kept the evening going with his brilliant MC and DJ duties. Over £3400 was raised on the night, plus the students from Dundee Dental Hospital Student Society presented a cheque for over £1700 which they raised from a recent 'Slave Auction'. The event was sponsored by Blackhills Specialist Dental Clinic and Dron & Dickson. 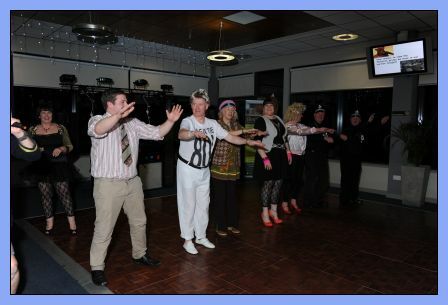 The photo is the 'lucky ten' guests left in the Heads & Tails competition who had to join in with a little 'YMCA' dancing. More photos of the event are available on the Borg Grech Photography website - www.borg-grechphoto.com - seach under 'Events' for the SCALP Retro Night.